Is that an actual (Conan Doyle-written) quote or is it just from the new movie? I often wonder what would happen if i dropped my glasses over the edge of something. Or more often, if someone else did. Yeah me too. THis game looks amazing and i hope they can pull it off. Google suggestions for "strip " are funny. 3rd one is settlers of catan. And there are 5,280 results for strip global thermonuclear war. This gives it a frequency of 16.4583333. Ok, i hadn't checked the website for several days, and then I look back for the first time since like wednesday, and there is this great comic! I almost laughed, and very nearly cried, so my face just kinda shut down with a saddish smile for a minute. Great comic!!!!!!! Topic: How would you be killed? Re: How would you be killed? You see, us <Insert profession at time of death here> have this little trick, it's sort of a way of cheating death. Except... it means I'm going to change. And you're not going to see me again... Not like this. Not with this daft old face. organman wrote: I fear that this may not be graciously professional. Thanks for the lol. My FLL team went to WorldFest last year as a Core Values Team. All in favor say Aye! I am a very dedicated Star Wars nerd. I have never seen this movie. EDIT: WHY DIDN'T IT FILTER!!!!!!!!!1111!!! Randall really should make an updated version of this. Also, Google doesn't seem to have the presence it should. It should be far larger than yahoo or anything else, but all I see is their volcano fortress or whatever. Topic: 0195: "Map of the Internet"
I'm just south of flickr! Topic: Dark Fantasy Web Comic. Re: Dark Fantasy Web Comic. I really like this wobcomic, and will be following it in future. Do you have an RSS feed? crucialityfactor wrote: Man. Anyone else realize that a platypus is just a duck and an otter smashed together? Where I'm at, it's Starbucks that are less than a mile apart. That's hilarious. 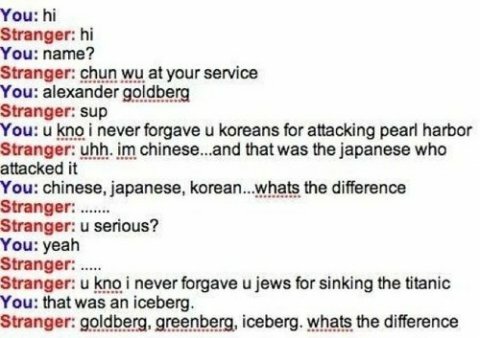 Goldberg, Greenberg, iceberg, what's the difference? Where did the otter/duck meme start? I don't get it. RPS wrote: Miami Shark is a game in which you play a shark. Who pulls planes into the sea. Thank you for your time, and have a good day. lol That is the most hilarious thing. I wonder if he really did that. I, for one welcome our new Google overlords. Lol. That is made of win. Topic: Favorite game of all time? Re: Favorite game of all time? There are probably a lot more though. [Luke,] I am your father!!! This one took me a minute. So he's wearing the wrist strap thing so she won't get pregnant right? I like this comic. Toy Story came out before I was born? And wow, even to me 9/11 seems more recent.